Since an overnight zit-zapper hasn’t been invented (yet… we're still holding out hope), a cortisone shot is the closest thing we’ve heard of that quickly diminishes pimples—specifically the large, painful kind that haunt our dreams and pop up at the most inopportune times. Basically what a cortisone shot does is it dramatically decreases the size and inflammation of a pimple. 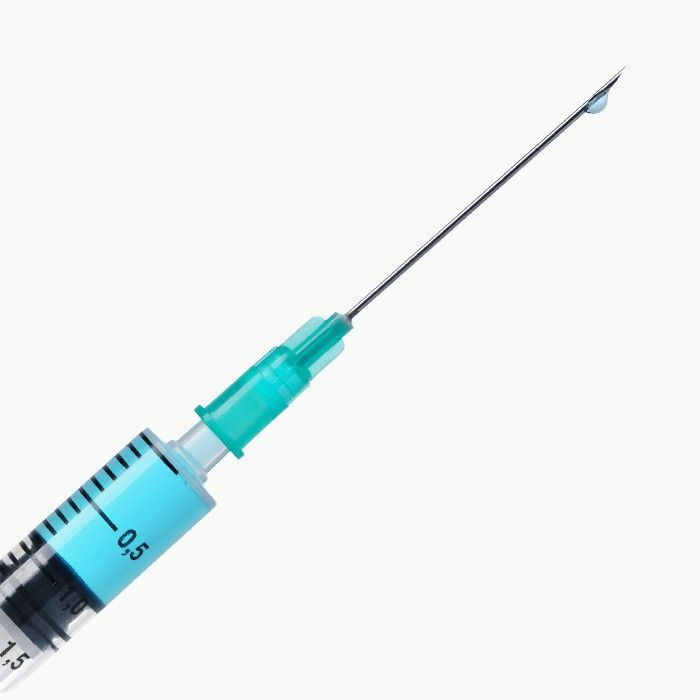 Just like a cortisone shot in the shoulder reduces pain and swelling, a small injection of a corticosteroid in a large acne lesion will reduce its size and appearance dramatically. And according to Schweiger Dermatology in NYC, cortisone shots are safe for all ages and all skin types. In other words: So long, pimples. We hardly knew ye. For three editors here at Byrdie HQ, we decided to investigate this magic treatment for a very similar reason: we each had one big, bad pimple that needed to be taken down immediately. While in theory the treatment procedure is essentially the same, we each had very different results and feelings toward the overall process. Did it work well for any of us? You’ll have to keep scrolling to find out. For Deven, cortisone injections became a bit of a beauty addiction. Once she saw how quickly one large cystic pimple disappeared, her visits to the dermatologist became frequent. However, because most of her breakouts were localized to two areas (her chin and nose), she began to notice pitting and scarring on her skin: “While I was warned about the possible skin depressions, I didn’t do my research as thoroughly as I should have. If I had, I would have found numerous sources that point out that too much cortisone or too strong of a dilution is what causes the pitting. Considering I often had two or three cysts on one side of my nose, filling them all up with cortisone probably wasn’t the wisest choice. “For months, I patiently waited for the depressions to disappear. Years later, I’m still waiting. I have a few little pits, or ice pick scars, on my chin and on one side of my nose. On the other side of my nose, I have a small collection of boxcar scars. No amount of exfoliation or retinol has been able to help. And every time a professional looks at my skin, they ask what happened, and when I tell them the reaction is always the same: a sigh and a knowing head shake. When done properly, cortisone shots can be lifesavers. “I didn’t start struggling with breakouts until I turned 24 (the quarter-life second puberty is so real). These days, I tend to break out on my chin around the time when I get my period. My routine of glycolic exfoliation and spot treatment with Renée Rouleau’s Anti-Cyst Treatment ($43), plus the occasional Origins Retexturizing Mask ($22), usually does the job within a week or two. (And in the meantime, bless Urban Decay’s Naked Skin Concealer, $28). “But a few months ago, I developed this meteoric blemish right in the middle of my cheek that refused to respond to OTC treatments. It stayed put for about six weeks before I decided to explore in-office options. Someone recommended that I try a cortisone shot, and after looking into it, that seemed like the right way to go. I’ve had many a large, stay-home-and-hide-because-it’s-so-huge kind of pimple, but recently I got a breakout that was so large on the left side of my face that I decided it was time: I needed to finally experience a cortisone shot. I’d heard so many glowing reviews from other people and how it helped practically eliminate their blemishes overnight that I was actually excited to book my appointment. Sticking a needle in a pimple may sound like a nightmare to some, but for me, I couldn’t get to the dermatologist fast enough. My one mistake before coming in, however, was popping the pimple the night before. I’ll spare you the graphic details and just say that it appeared “ready” to be extracted, but revealing that I had done this to the physician assistant who performed the procedure warranted a “tsk-tsk.” Despite my best efforts to get the gunk out of my breakout, she still had to drain it prior to injecting the site, but both the extraction and the needle poke barely hurt, and I was out the door before I knew it. Come evening, the pimple had already shrunk in size, and I was able to meet up with friends without feeling nearly as self-conscious as I was that morning. The next day, however, I had a bit of a scab where the pimple once was. It was entirely flat and easily camouflaged with concealer, but when the makeup came off, I was bummed at the dark lesion staring back at me. The scab lingered for a few days, and eventually I was left with a small area of hyperpigmentation. I got the shot a few weeks ago, and today some slight discoloration is still there, so I’d have to say that and the scabbing are the only downsides (but I’m sure my popping the pimple is to blame here too). Would I do it again? Possibly, if the pimple was large enough and I had an event or something coming up, but otherwise I’ll stick to a healthy diet and proper skincare to avoid breakouts in the first place. Have you ever gotten a cortisone shot? What was your experience like? Please tell us below!